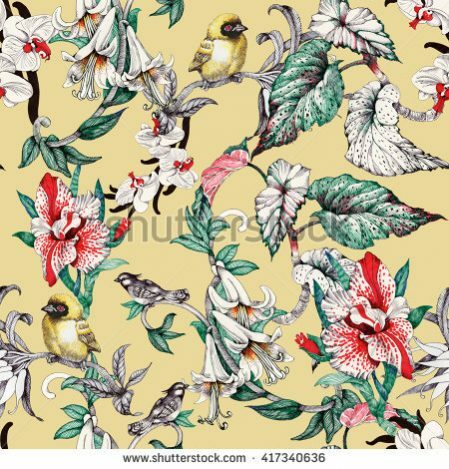 Print especially, digital prints has become a big fashion favourite over the past few years and it will be very much part of Spring/Summer 2018, trending right across the board from summer dresses to skirts, trousers and costs. 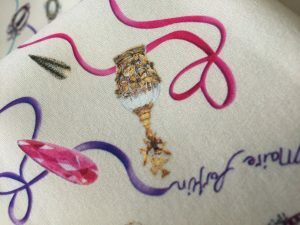 Prints will be included across different weights of base fabrics such as Crepe Satin, Double Crepe, Crepe de Chine, Chiffon, Georgette and silk in varying degrees. It is also very popular for mother of the bride outfits. And we look at some of the strongest trend setters, Alexander McQueen, Prada, Alberta Ferretti and Chanel taking to the catwalk in London and Paris paving the way for the rest of us. Inspired by the shows and the trends we have seen emerging on and off the runways for the past year, a number of top print themes were identified for the Spring / Summer 2018 time frame. We can expect to see intense hues of the tropical rain forest used in a number of ways, with the introduction of tropical birds, leaves from the vibrant colours of the forest floor to the warm oranges, sunshine yellow and spicy colours of the tropical summer afternoons. So expect to see palm trees, novelty fruits and again we will see animal prints. Other abstract creations will be inspired by Bauhaus and traditional African tribal art which will make bold and mixed up statements. Primary Palettes with stripes in a primary colour palette is the another option. The cobalt colour trend dominates in this category as does yellow. Again a sleek and often bold look with outfits that are half white and half black detail ranging from dots to checks, and can be a very sophisticated look if not too overbearing. Across the board, pistachio is an emerging colour trend for 2018 with bright pops including canary yellow, orange, red, and rust. Also, we can expect to see a lot of earthy and autumnal vibes to this creative and colourful trend. So the mix of colours and atmosphere will bring will bring with it a lot of scope for both variety and the opportunity to be adventurous in design creation. As my preferred option, I have created my print designs to introduce Tropical forest flavours which, when used along-side base colour fabric becomes more of an enhancer rather than the total look to my 2018 collection. 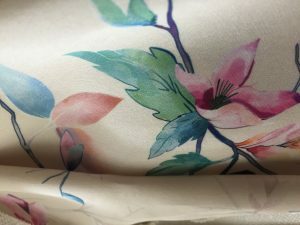 The print will provide that injection of colour and atmosphere which compliments the overall fabric base colour. It will be used as trimmings or introduced in the lining to provide a flash of vibrant colour for example.